Mother Cabrini died on December 22, 1917, at sixty-seven, suddenly and alone in one of her Chicago hospitals, while preparing Christmas presents for 500 children. O Apostle of the Heart of Jesus, Great Missionary and Mother of Missionaries, Saint Frances Xavier Cabrini, full of admiration for your sublime virtue and confident of your protection, we call upon you as our powerful mediatrix and advocate with God. You, who did say with the Apostle, “I can do all things in Him Who strengthens me”, obtain for us an ardent and lively Faith, an enlightened and zealous Charity and a firm Hope that may strengthen us along life’s difficult path. 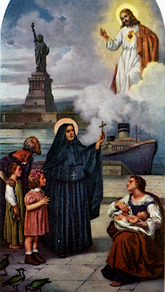 O glorious Saint, who so loved the souls redeemed by our Saviour, turn your maternal eyes towards your daughters who invoke thee, towards the youth exposed to so many dangers, towards the sinner, the sick, the worker, the emigrant, the prisoner and towards all who are living in sorrow. Help those countries that are in sorrow, yet trust in God, the nations which you benefited with your good works and particularly that country which was your last earthly abode. Extend your pity over the whole world torn by strife and sorrow. Grant that we too, Saint Frances, may one day be united with thee in thy glory in Heaven, where our Sovereign Lord Jesus Christ liveth and reigneth world without end. Amen.